This morning my son Thomas called in a panic, a rarity. He handles life so well and is such a dear soul that when he’s calls to report “good news and bad news,” something’s really wrong. Today, his dog, Huntly, and furry roommate Magnolia, slipped out the deck gate of their house in Raleigh, NC, and went for a long, unsupervised run through the city streets while Thomas was at work. Thomas found out from his roommate, who called to say the dogs were missing. Thomas found Huntly, an Australian Shepherd, on the Internet while he was working a summer internship in Bangkok, Thailand. He emailed me Huntly’s photo and announced he wanted to buy him upon his return to the States, right before he completed his senior year at UNC-Chapel Hill. Despite the advice of his parents to the contrary, Thomas followed through on his purchase and kept Huntly at school and later took him to Raleigh for his new job after graduation. We counseled Thomas that he may be just feeling a little homesick after a semester abroad at the University of Edinburgh, Scotland and a summer internship halfway around the world, but Thomas was not to be denied. He knew what he wanted, a sweet, affectionate, high-energy dog that he could train to chase and catch the frisbee. Thomas has always been a loyal friend. Even though as a child, he lived in Charlotte and Atlanta, he has tried to keep ties with friends in each city and those he developed during his journeys around the world. 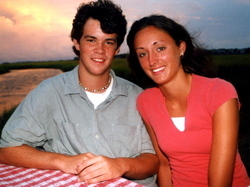 Of course, Thomas’ closest friend is his girlfriend, Amanda Brown, whom he met at a high school basketball game in April 2001 when they were both sophomores. They’ve been inseparable ever since, surviving the surefire test of going to colleges halfway across North Carolina from each other. She graduates next month from Appalachian State with two degrees and she may join Thomas in Raleigh, depending on job offers. They have an amazingly stable and close relationship, drawn even tighter from their semester together in Edinburgh (Amanda went to another college across town that semester). But his closest buddy these days is Huntly. Thomas works only a mile from his house in Raleigh, so he’s able to go home at lunch and play with him. But today, the playful dogs bounced their way out of the gate, which may have been left unlocked by a weekend visitor. Thomas tried to keep his mind on his job as a stock market investor, but he was having trouble. About 45 minutes after first getting word of their escape, Thomas’ cell phone rang. A neighborhood veterinarian from Crossroads Veterinary in Raleigh happened to be driving down a busy street, when she saw Magnolia and Huntly run out in the traffic. Magnolia slipped away, but Huntly was hit by a passing car in front of the vet, who stopped, grabbed Huntly and took him to her hospital for treatment. Luckily, Huntly only suffered bruising and some sore ribs, as the X-rays showed no broken bones or serious internal damage. I tried to explain to Thomas how the angel on his shoulder was watching after him again, with the vet being right on the scene, but Thomas of course was very shook up by the trauma and most concerned about Huntly’s health. Huntly will be home healing soon. They secured the gate at Thomas’ house so the mishap won’t be repeated. Thomas is back at work and we’re all thankful it wasn’t worse than it was. I tried to remind Thomas of the blessing this day really brought … that God allowed Huntly to only be nicked by one car and He sent an alert neighborhood vet in the next. Oh yeah, and the good news Thomas was calling about … he was promoted, along with four or five others in his freshman class of 24 at a new Raleigh office, a division of a New York investment firm. The firm enlarged Thomas’ ability to trade or option larger blocks of stock during the day. So, today, Thomas’ job awarded him larger parameters. Huntly and Magnolia tried to enlarge theirs. I’m hoping everyone in Raleigh – as well as the good Lord – keep their eyes on those dogs, just to ensure they don’t try it again anytime soon. 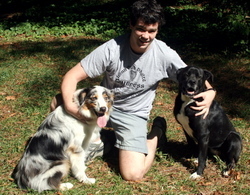 Photos: Thomas Schroder with Huntly, left, and Magnolia in October 2007; with Amanda at St. Simons Island a few years ago. This entry was posted on Monday, November 5th, 2007 at 7:00 pm and is filed under Family, Fatherhood, Spirituality. You can follow any responses to this entry through the RSS 2.0 feed. You can leave a response, or trackback from your own site.